Mikes Aunt Pearl has a special place in our hearts; although she didn't have a lot of money, when she passed away she left all of her nieces and nephews a little remembrance. The original bequest was spent on frivolities like groceries and bills, but we always thought that one day, we would find a way to use that amount for something memorable. This summer, I sold my online plant business, and lo and behold, the amount I received for it was equivalent to the original legacy from Aunt Pearl! Instantly ear marked for our most ambitious project to date, our tiny house, this has now come to fruition. Life changes are in the very near future. 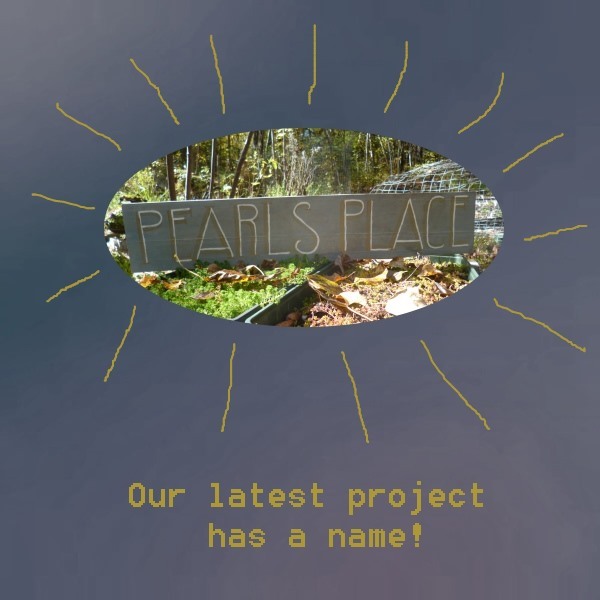 Fittingly, the working name for our project is Pearls Place, something that blends nicely with our theme of an old western town; picture a little shanty town from the old west, with boarding houses, old mine shafts, rustic accents all over and that's Blue Fox Farm. Ideally, I would have loved to design and build a small timber frame house, or an earth ship; this didn't happen, but we tried to be as sustainable as possible. 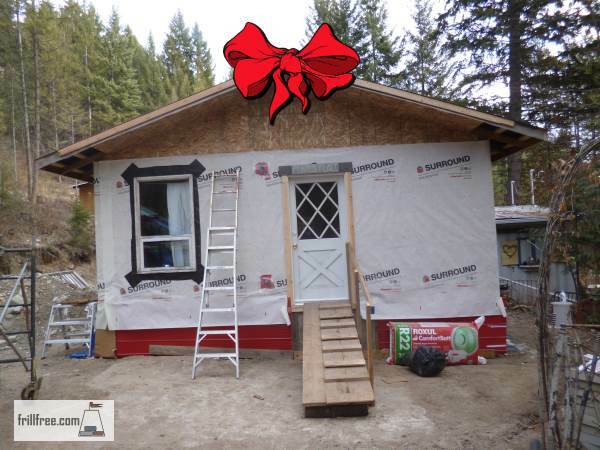 The supplies that we could find locally, such as the insulation, the oriented strand board made from chipped up waste or small wood came from all over B.C. and the windows and doors were recycled wherever possible. See more about how we got started on this time constrained project; we moved the trailer on September 21 which just happened to be a full moon...then moved on to site preparation. The next item to be dealt with was the excavation and footings. Once the foundation had a bit of time (24 hours!) to set up, we got the beams and floor joists in place. Floors and the walls took a while, and then the excitement of the roof trusses. In between times, we did some insulating, wiring and vapor barrier. Windows are important too, let's not forget that part, and doors make a huge difference in how the place holds the warmth from the woodstove which burns fire wood from our property. This project is ongoing; it has only taken two months to get to this stage; I can't wait to get to the fun part; the interior decorating of this great little cottage. Update; it's September 2014, one year from when we started this project. Now we have a cozy little cottage, still not completely finished but certainly livable. With the heating season just around the corner, we've got some firewood in ready to go. Some things we've been working on are getting the interior buttoned up; the walls on the bathroom are slowly being paneled with v-groove local wood, in denim or bluestain pine. Little touches like antique medallions and door frames are being added as we go along. It's all coming together now. 2018 update; We built an addition - it adds 100 square feet of living space, consisting of a mudroom and entry, as well as a reading nook, guest quarters with lots of light from two giant windows. Also, a covered porch makes it all complete - Bracken loves to sit out there, out of the rain, keeping watch. Oh, the Trials and Tribulations!